It helps me stay focused. It's a great idea and exactly what I need. However, I imputed a whole weeks worth of workouts and an hour later, it erased everything I added! This is very frustrating, I hope the developers can fix this problem. I wish you could add color coding. It helps when organizing your days whether you want to have a leg day or a cardio day. New update erased all of my data! 43 year old male getting back into the gym. Not my first rodeo but at the advice of a trainer friend I was looking for an easy way to record my workout progress. Wanted something simple that didn't take up lots of space on my phone and I was easy to use. This is it. Couldn't ask anything more out of this free app! It's great up with your daily workout. Not too difficult to navigate. Easiest workout tracker I've had. I have had this for a few weeks now. Based on the reviews I have hoped to have more functionality. While you can enter details about your workout, you can't do anything with them. The calendar has limited fuctionality. If you want to keep track of your workout days, then this can help. Limited abilities after that. This app is pretty much I need to keep track of my workouts. A very neat app to have! This is my favorite workout app. It keeps me motivated by showing me how many days I have worked out during the month. I don’t want to break my streak so I keep going! It also helps me keep track of what I have done so the next day, I can work on something else. It’s simple to use and I can put in my own workouts instead of following along with someone else’s plan. This app is a great tracker. It allows me to effectively keep track of my workouts and let's me see how often I workout. This workout app has a clean and simple interface. I love how it’s easy to view your workout days from the monthly calendar view. Other apps over-complicate fitness with too many options for workouts, schedules and alerts. Think of this one as a simple, digital fitness notebook. Super easy to use, and clean UI. Only thing I would like to see is a widget for showing what my workout is today or the next day. Great job. Keep it simple. This app doesn't do anything special, nothing a regular calendar or remind apps can do. The reminder function doesn't even work, waste of money & time using it. It's exactly what I've always looked for & finally found it. You can keep track, add reminders etc. to all your daily routines. 06/27/2018 Newest update doesn't work. App crashes and I can't get it to open. 2 years ago I updated and all my workouts were erased. The new update did not change any features or improve this app. Just wiped out my info. Hope this doenst happen again. Fantastic app for staying on track with your training program. Finally found an app similar to my old streaks app. Thank you! Simple but great. I was looking for a calendar that was easy to use for recording workouts and that was separate from my already cluttered calendar. I found this with this app! It is so easy to use and has a simple yet sophisticated-looking interface. Thank you for creating this! I just wanted a simple app to keep track of my workout rotation while doing Beachbody Piyo - I know I'll lose their calendar! This is easy, straight forward, and satisfying to check off my workout once it's complete. I love the app but, ever since they updated the software it has been buggy - please fix!! Andrei was so responsive and helpful! I would recommend this app to anyone! Great app I needed to be able to organize my workouts since I'm juggling running swimming and spinning it's super easy to use and helps me plan my week. Thanks! I was looking for a straightforward scheduler for my workouts and this one works great. Starting P90 (the new one) and you alternate days but I don't want to do it on the days recommended (want to start on a Saturday not a Monday). This app let me enter the entire 90 day calendar and remind me of the workout to do each day. Not only is the scheduling easy it allows you to mark each workout as 'complete'. great app. Definitely useful for tracking exactly what I do and how often. I basically just paid a dollar for nothing. The app keeps crashing on me for no reason. Please add an option to recur every X number of days!! My workout plan repeats on a 5 day cycle and the only options are to repeat every day or every week. This means I have to manually input every day of my workout schedule. Other than that, I am a fan of the app layout/functions. 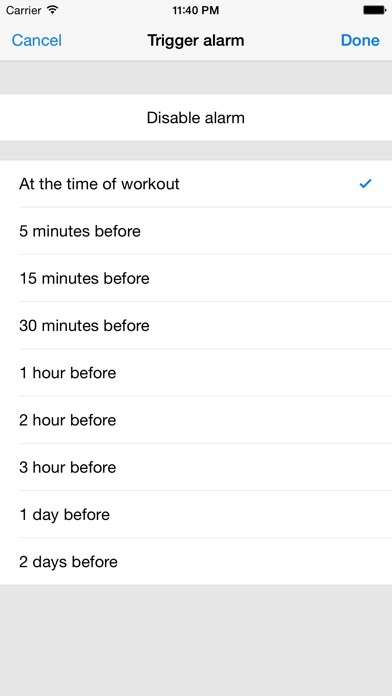 Perhaps also add a satisfying sound after checking off a workout (similar to Wunderlist's sound). Psychologically I've found this adds to a sense of achievement after completing a workout. It doesn't post to Facebook like it says it does in description. It also crashes. It's just a calendar with reminder alerts. Waste of a dollar. If you lost your data with the update, email Andrei through the support option in Settings. Was able to get easy to follow directions to get all my data back. Super fast response. Thanks for this awesome app Andrei! this app is great for having a visual of the days you worked out. it has a check mark for days you completed your workouts and an X for days you didn't. you can jot down notes as well like a daily journal. gave it only 4 stars because i would've liked for it to be a little bigger so it could show tiny details in calendar box to see my weight every day, but it doesn't. still great though. This app is just what I needed! 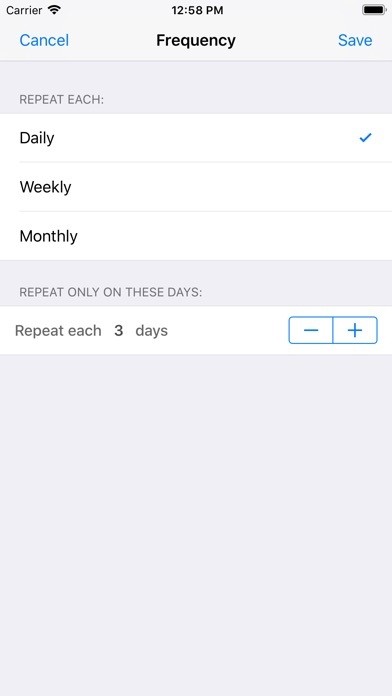 It's basic and allows me to schedule my own workout sessions without making me sift through all the ads and workouts provided by other exercise apps. It's flexible, offers many scheduling options, and allows you to leave notes! Also, the layout is very professional, clean and easy to navigate. Plus, all proceeds from purchasing this app go to an individual with Parkinson's. That's very important and significant to me. 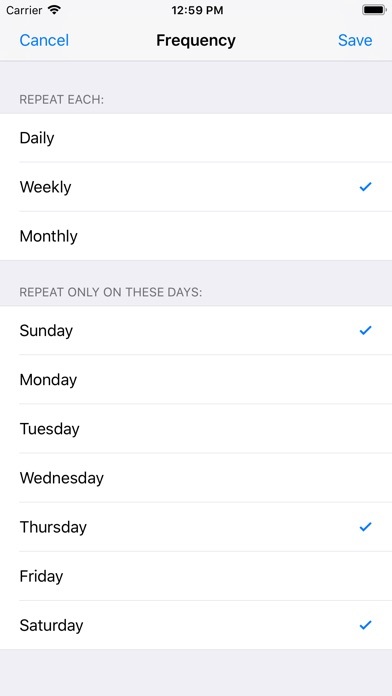 I still haven't found a way to get this app to notify me when a workout is due, but since I set up my own recurring exercise schedule, that's not critical. I just open the app and there's my workouts for the day. I've been looking for a simple calendar app to keep track of my workout days. This thing is simple and does exactly what I need it to do. It helps me keep track of what days I work out, and what I did. I like that I can add notes, like what route I ran or what pace. Worth the tiny price. I'm in the quest of the perfect calendar workout app. 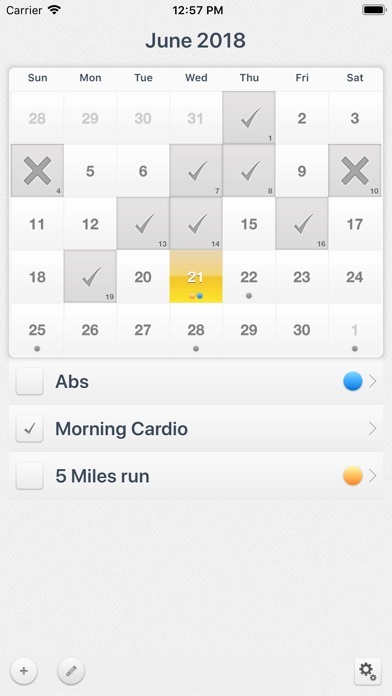 I need a calendar view with the options to add my workout whatever that may be. I took a chance and I regret spending $.99. I could have bought $.99 burger and relish in my guilty pleasure. I added my workout (upon reflection it's something you can add on a regular calendar, but I wanted something I could check off and see my progress only for my workouts) and today that I opened the app to check off my workout, it had erased all my workouts. Not only that, but the reminder does not work. I set it to remind me at the time of the workout. It didn't ring once! Like someone mentioned, they used it for their P90X, I wanted to use it for the same program, to set the day I wanted to start and also I don't follow the program by the book. I like to change some of the workouts and/or switch days. The other apps don't allow flexibility. The app has potential to be a good app. A workout calendar where I can add workouts and under each workout the type of workout, for example, if I'm doing weight training, I can add bicep curls, the reps and weight. If I'm running, the lapse, time, speed. I'll rate 1 star and until I see improvement I will change my rating. 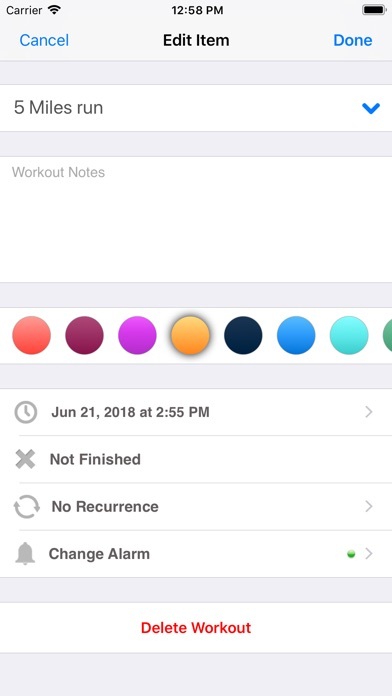 I love using this app to keep track of my workouts and you can even add notes! This app keeps me accountable and track my work outs. Seeing a few days of checks keeps me motivate to reach my goals. It's a simple app that will keep track of your workouts. Goes so well with my schedule, incredible user experience and awesome motivation for future exercises!!! 5 star app!!! I just want a calendar that shows my days I've worked out in a month with some notes on what I did. This is exactly that. No videos, no diet crap, no mandatory inputs for weights,reps & sets, miles or time. I know how to exercise and don't need a bunch of fluff. Beautiful app & only one of it's kind I have found. Job Well Done!! Simple, easy to use, add, rearrange, change with ease. I love it! Great for keeping track of workout plans and completion. I wish it had an option for color coding days-- would make it so much easier to see when exactly a race is coming up. Please add this feature! Works as it should- perfect for busy day to day life. Simple and easy to use. No problems. Does what it says. Would recommend it to anyone who wants to keep track of their workout schedule. This app is working perfectly for me! I have it right next to My Fitness Pal on my phone, and since I’m try to focus on consistency in exercise -not calories used, it’s great (MFP won’t let you log exercise without increasing calories). You can put any notes you want on it. If you skip a workout you’ve scheduled there is an X for that day, if you complete it there is a check mark. I find it extremely motivating to check the day and look back at the calendar and see that consistently. Thank you for the app!